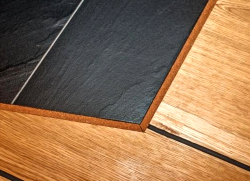 While connecting different types of floors, eg wooden boards with tiles or carpets with laminated panels, it is necessary to ensure proper surface dilatation in the previously prepared expansion joints. The use of two different materials, one of which is a continuously working material (eg wood) requires an appropriate expansion gap, which can't be too small or too large. The optimum width of the expansion joints is not less than 5mm and not more than 10mm. The cork expansion strips compensate for the "work" of the floor in places where there may be warping and deformation of the surface. The cork is used to fill it, as this material isn't only an aesthetic finish on the floor, but also plays a very important roll - it absorbs all stresses related to floor work. The high elasticity of the natural cork means that it can be repeatedly compressed when the floor becomes wet and stretched when it is lost. Cork expansion strips thanks to special investment, for the best expansion properties, which are the main benefits for this type of application. The strips made from our cork, are resistant to crushing, registration, it is the most important for our customers, it is a completely and smooth raw material. Elastic cork strips are cut during the assembly with a classic, sharp wallpaper knife. Cork is glued into the expansion joint in such a way that the side in contact with the ground is not permanently attached to it, allowing the cork to work freely. Therefore, apply the adhesive only to the side surfaces of the stopper. After pasting the cork expansion strip into the gap, it is worth covering the skirting with protective varnish for the natural cork or wood, in order to protect the material against contact with dirt and water. Are you looking for a cork sltripes with other dimensions? Check the remaining sizes or send a request for battens with non-standard dimensions. Cork floor sealers can be cut with a usual wallpaper knife when installed. Cork expansion joint has to be placed in the dilatation gap in such a manner that the side that touches the surface was not bound with it. That is why the glue is applied only to the sides of the cork. After gluing the dilatation in the the gap it is worth finishing it with cork or wood protective laminate to protect it from dirt and water.